† Scott  lists the black surcharge first and dates in as 8th January, then the black surcharges and dates them 10th January. Gibbons reverses this: red first on 8th, black on 10th. 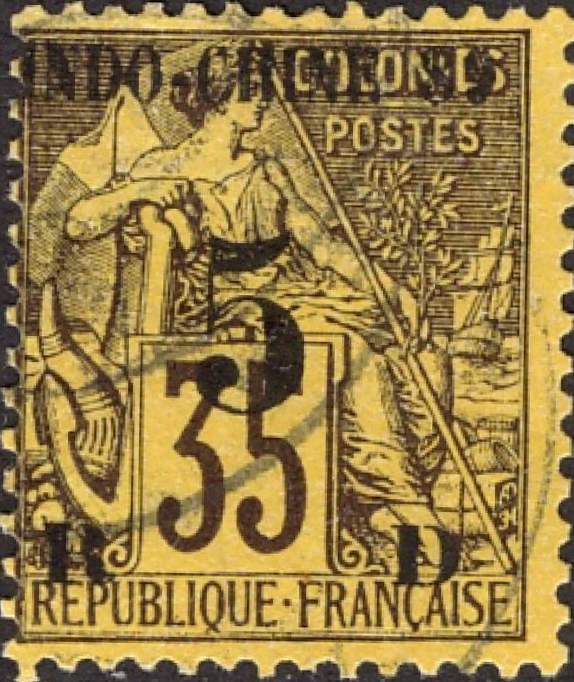 ‡ Three stamps on the sheet of 25 with the red surcharge had the date of 1889 in a smaller font (Sc2a SG1b). Pairs of the two types do exist but are very rare. 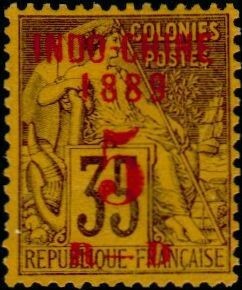 To summarise Mackay , the French conquered the area in late C19th and gave it the name Indochina from 1888 onwards, covering the colonies and protectorates of Cochin-China, Annam and Tongking (Vietnam) and Cambodia. Later additions were Laos (1893), and Kouang-Tcheou (1900). Mackay notes that with "an area greater than France itself, inhabited by people of diverse races … it is not surprising that colonial rule was resisted to a greater or lesser degree". The resistance was greatest in Vietnam, eventually leading to the Vietnam War. Images from David Olson, colnect, TB.